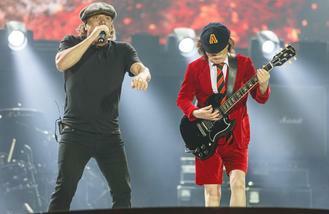 The 'Highway To Hell' hitmakers announced the news on their website www.acdc.com on Tuesday (15.12.15). The announcement reads: "MORE BIG NEWS! The 'Rock or Bust World Tour' is coming back to Europe! The tour dates begin on 7th of May in Lisbon, Portugal at Passeio Martimo De Alges and runs through 12th of June at Ceres Park in Aarhus, Denmark (see below for full list of dates). Tickets are on-sale starting, Friday, December 18 (sic)." The Australian rockers - who have been clocking up 50 shows around North America and Australia - will perform without founding member Malcom Young, who was unable to continue with the band due to suffering from dementia, and ex-drummer Phil Rudd, who was given an eight-month home detention sentence for drug possession and making threats to kill earlier this year. However, Angus Young, Cliff Williams, Brian Johnson, Stevie Young and Chris Slade will soldier on and play the tour, which sees the heavy rockers play two massive shows in the UK in June at London's Queen Olympia Park and Manchester's Etihad Stadium.